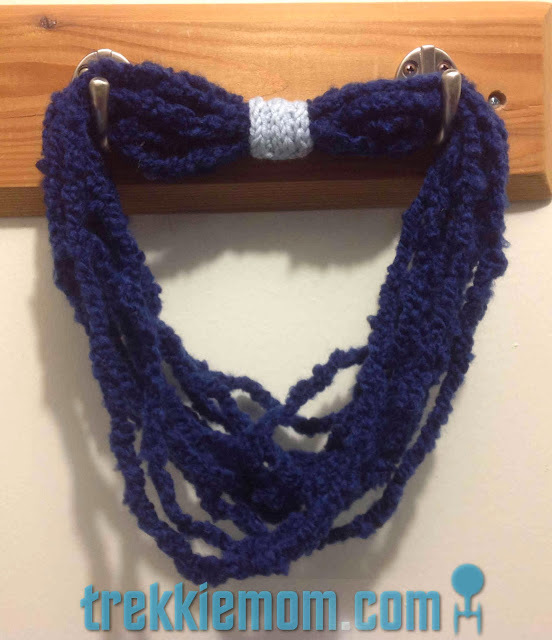 I have NEVER crocheted a thing in my life, and I was able to do this in 2 hours, the necklace part at least. 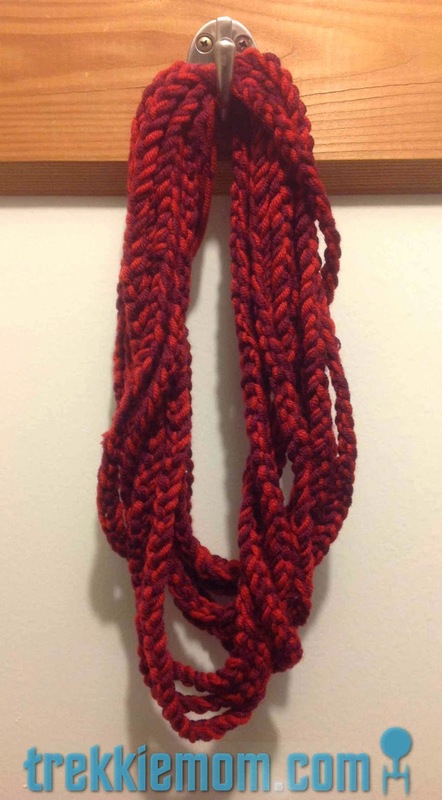 This scarf has 11 strands/loops. I have no idea how many stitches I used. I just kept going and trying it around my neck until I was satisfied. To get the right 'size', I looped it tightly around my around my hand and elbow like I was coiling rope. Because the chain stitch has a lot of give, it shrank to a nice size for my neck. 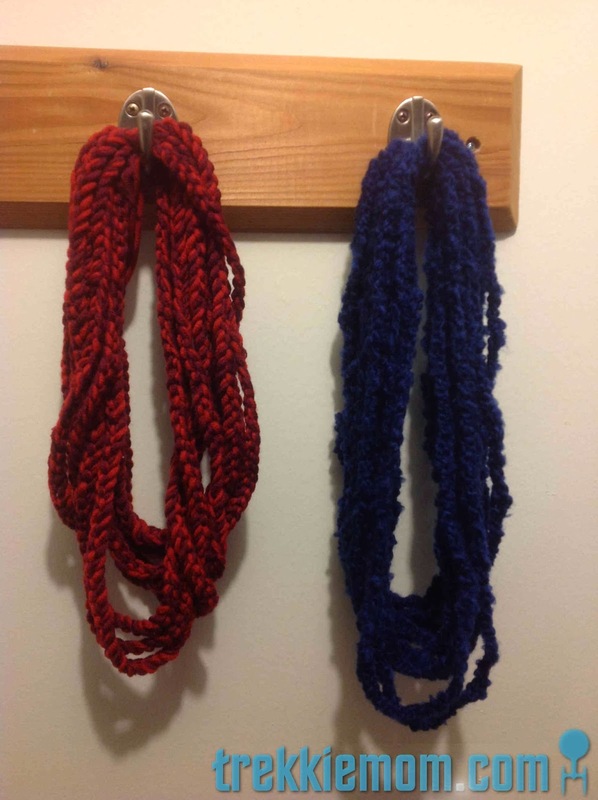 I tied the loose ends together, and then tied them around the other loops to keep them in place. And this one I did last Saturday night. 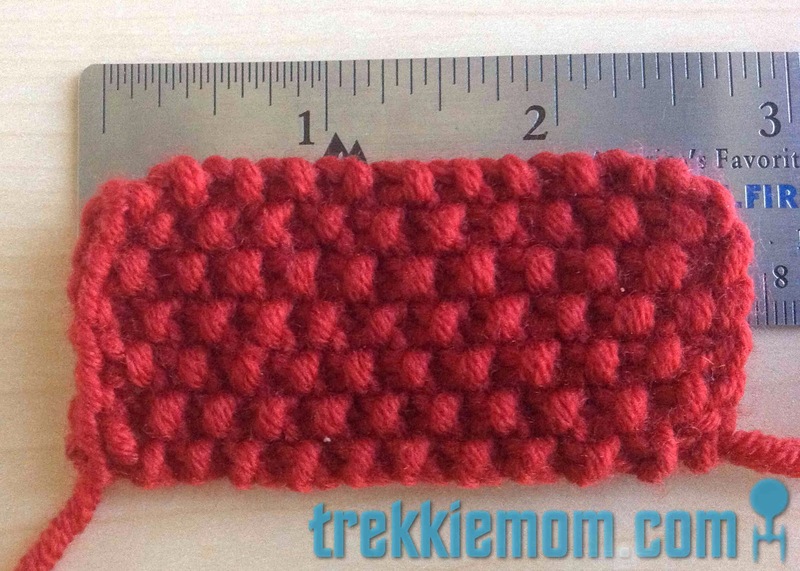 Since I used 2 yarns together, the stitches were larger, so this one only has 10 strands/loops. I was also able to see that my stitches were not very regular. Thank heavens my first go at this was with the textured yarn so you can't see my stitches at all. I had to take out a few stitches as I went along to get the perfection that I always try to achieve, and I am very please with the results. 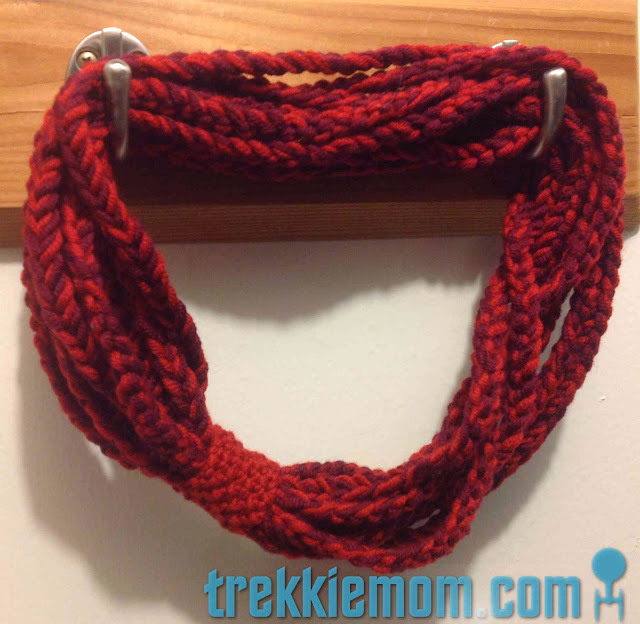 This project allowed me to use up a scrap of beautiful, dark, wine-red yarn, and the combination with the rust colored yarn is magnífico. 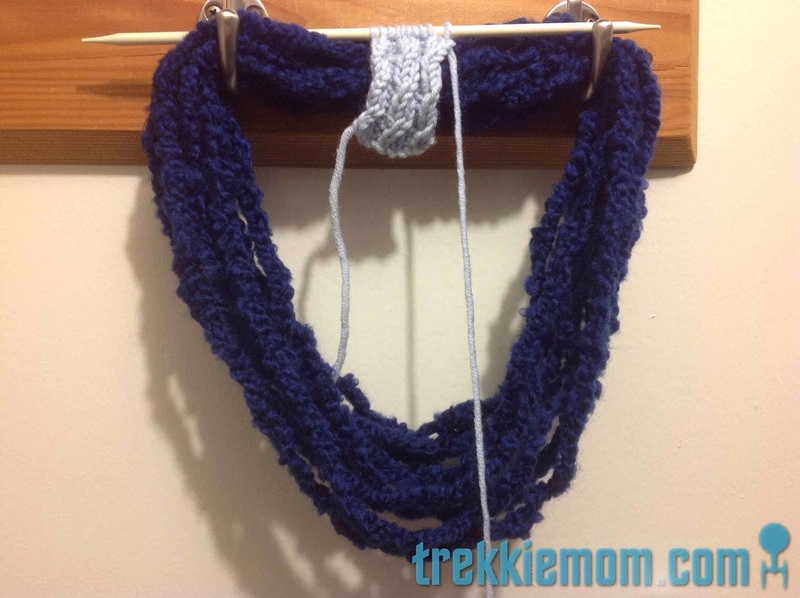 The yarn I used for this one is Lana Grossa's Bingo 100% Merino Wool. It is from a stash I purchased almost 10 years ago when I did my internship in Germany. While you can purchase Lana Grossa Yarn in the States, you won't find it in your garden variety craft shop. Sorry, Joanns! What I love the most is that it is the softest wool that I have ever felt. To finish them off, I did not use a leather piece like Delia, but I wouldn't rule that out in the future. 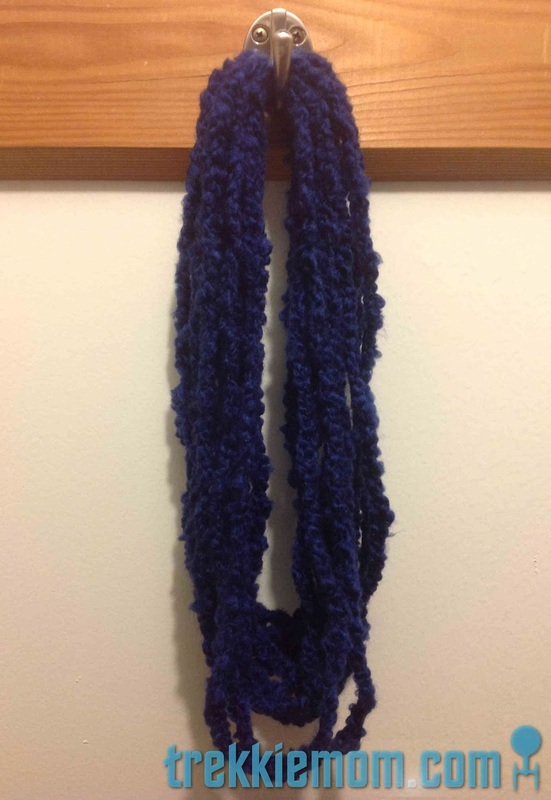 Instead, I chose to knit a piece with contrasting color with my favorite Lana Grossa Merino Wool to polish them up. On the blue scarf I used a simple cable on the knit stitches on the 'right' side of a 2x2 rib. 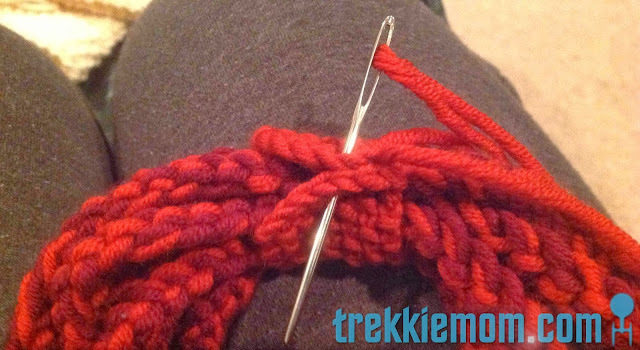 I cast on 10 stitches and started with k2, p2 repeat, ending on k2. That was my right side. Every 4th row, right side, I added the simple cable, k2tog, pick up a stitch from the back of the k2tog stitches. I made both embellishment pieces approximately 2 3/4" long. Just keep measuring your piece until it looks right, and make sure you have enough to sew the ends together with your sewing machine, or like I did, with the same colored yarn. When you sew the ends together make sure you are sewing with the wrong side facing you and that it is already wrapped around your scarf, unless of course you are going for a different look than mine. Finally, flip your embellishment piece right side out. Stitched ends are hidden, beautiful. Here I chose a seed stitch for my embellishment piece. Too bad I have already earmarked these guys for friends and family. I love them. I guess that means I need to make another for myself. Akk! There is so much more to make for Christmas!